Last weekend I went to Orlando, FL for the first Harry Potter and the Sacred Text weekend pilgrimage. Harry Potter and the Sacred Text is an amazing podcast. It’s especially fun if you are a fan of the Harry Potter stories, but there is a lot more to it than that. The Harry Potter series is an accessible text to practice sacred reading practices with. I have learned a lot about various spiritual and sacred reading practices through listening to this podcast each week. Fun Tip: if you want to try sacred read practices with your favorite books, use your tarot or oracle cards to select a theme. The hosts, Casper and Vanessa, discuss the theme with guidance from Ariana, and talk about where they see these themes pop up throughout the chapter and how it relates to their lives. Then they participate in one of many sacred reading practices: lectio divina, pardes, ignatian contemplation, havruta, florilegium, etc. But after doing the sacred reading, each of the hosts offers a blessing to one of the characters in the chapter. This has become one of my most favorite parts of the podcast. They chose Orlando for this pilgrimage because this is the home of Harry Potter World at Universal Studios. I thought about going by myself, but I realized I needed to go with my mom, who read all of the book out loud to me and my sister. And of course we invited my sister as well. So, this trip was not only a pilgrimage to the Harry Potter holy land but an opportunity to spend time with my Harry Potter family. And I recognized the deep need that humans have to share in both celebration and grieving with other humans. We broke up into smaller groups to go to three workshops. I won’t spend too much time telling you about these but they do add context to the overall journey I want to take you through so stick with me. Vanessa’s workshop was the practice of sacred writing. This is something I have talked about in other posts. Basically, the practice of automatic writing to reconnect with your inner wisdom. Or even the practice of journaling to pull your thoughts from the mental realm into the physical realm. Ariana’s workshop was about the practice of imagining the life of the characters in a story who are on the margins. In fiction we center around the main character and all events relate back to that person. The other characters, like, bartenders, newscasters, coworkers, etc. only exist in this text to create a realistic setting for the hero to live in. But what if we were to imagine how they live without the constraints of the stories pages. We then brought that idea out into our own lives. I invite you to think about whether there are people who you see on a regular basis like the people who work in the restaurants you eat at or the grocery store clerks or the homeless people you interact with. Or maybe even people you’ve only interacted with once and probably won’t again. How comfortable are you imagining their life? What are the things you do know about this person? Is there something you can imagine about their life? When I did this in the conference, I was really surprised by what I came up with. It’s an invitation to zoom out from your own heroes journey and reach out to the other people in your environment to recognize their humanity. Casper lead a session called, “The Art of Blessing”. When we talk about the blessings in our lives, we ask for blessings to come our way, we bless others when we meet them, but what does it really mean? What do you think of when you hear the word blessing? What does it mean to you? Is it that things are going well, or in the right direction? Does it mean you are prosperous in your health, wealth and something else? Are you in the Universe’s favor? There’s no right or wrong answer, but we are probably in agreement that a blessing is a good thing, right? The idea that the source of power is blessed. The Universe, God, spirit, etc. is a blessed source of light and love. The blessings we are able to offer to another person. This is third type of blessing is what Casper focused on in his workshop, how to bless another person. 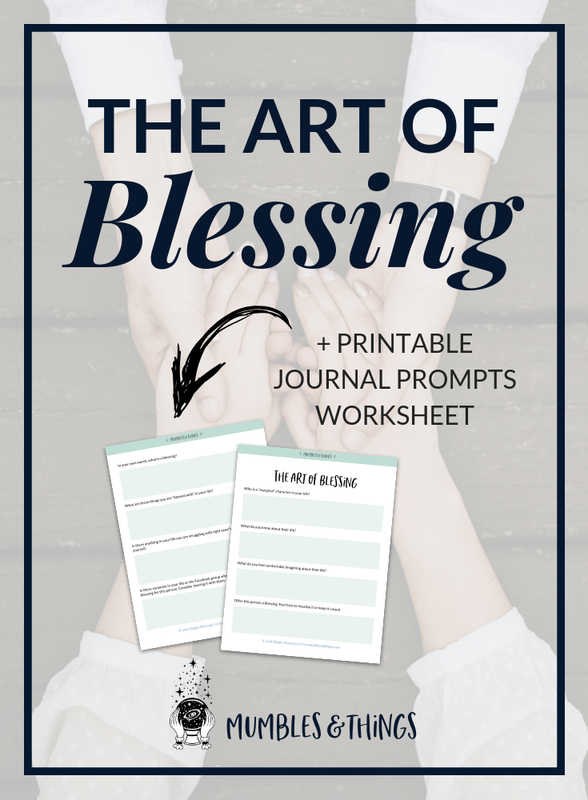 Let’s go through a little bit about those first two types of blessings. Then we’ll really get into the Art of Blessing. A blessing is the way the Universe gives power to someone, especially so that they can fulfill their purpose to do that which they are designed or intended to do. Alternatively, a blessing is the moment you claim your power. It’s a light that enables you to recognize and receive your purpose. When you say “I am blessed,” you are acknowledging—with gratitude—the sources of your power. Or, perhaps you are affirming something that is not yet true but you want to manifest. Blessings can be in the form of your power, what you are intended to do with your life, but also in the form of material possessions, health, relationships, success etc. I am blessed with a high self-esteem. Whatever you are blessed with, these are your motivators, which is the source of your power. And by claiming them you are affirming your joys. Related: How Do Affirmations Work? Now, some people get a little weird about saying, “I am blessed with … [fill in the blank] …”. It’s like they think that if they are blessed with these things, it means someone who doesn’t have these things isn’t blessed. But this isn’t the case: you acknowledging what you have, has nothing to do with what someone else has. They just have other things to express gratitude for. In the age of #blessed, the true meaning of this word has been somewhat warped. So, if it feels better to say, “I am grateful for … [fill in the blank] …”, do that. The sentiment is the same, the purpose is to focus on your blessings and you will continue to see more of the same. If you have ever blessed the Universe, you are simply recognizing this as the source of all blessing. You might have heard it in the form of “Blessed is the Lord.” Especially in religions like Christianity and Judaism. Whatever your beliefs circulate around, the Universe, God, spirit, etc., the power you have and all that you have, and all that you are comes from somewhere. I think my mentioning of monotheism might throw some people off, so let me explain. Some of you may have complicated relationships with organized religion so I want to take a second to talk about language. When you bless the Universe, it is an acknowledgement that you are a co-creator of your destiny. Hermeticism is the philosophy for the principles of magick that I follow and talk about throughout my blog posts. The idea of divinity is misleading because it makes the assumption that there is a distinction between the divine and us. But as part of “the All” we are part of the divine, whatever you want to call it. Therefore, when we remember the divinity of the Universe, through blessing it, we are also blessing ourselves and claiming our power of manifestation. Now we get into the heart of it. No matter if you practice in a coven or on your own in private, you are part of a greater community: Your family, your friends, your neighborhood; the witchcraft and spiritual communities; the human community, the community of Earth dwellers. No matter how isolated you feel, you are an important part of the bigger picture. I personally believe that a community is about the give and take of love. This really is the art of blessing: the ability to both give and receive love. Some people need more help (in the form of emotional, spiritual, financial, or physical support) than others, but that doesn’t make them any less worthy of it. There is a certain dance involved in needing support and offering support: sometimes you are stepping forward and sometimes you are stepping back. When you bless someone else, you are in effect asking the Universe to send blessings to them. Or, in other words, you are calling on your divine power to spread blessings with this person. A blessing evokes a sense of warmth and comfort, and it gives us a way to connect with another person. It is to either offer or receive a ritual of protection, encouragement and guidance. This connection suggests that no life is alone or unreachable. Each of us is connected through spirit or the universe or the collective unconscious or whatever force you believe in. And sometimes we suffer, or fall into chaos, but we are never alone in it. Although the world we live in makes us feel that way sometimes. Sometimes you might feel as if you don’t belong or your communication is cut off. A lot of witches have felt this way. And part of claiming the title of witch is claiming our power, but when we feel alone, it can be hard to feel empowered to pursue our life’s purpose. By recognizing blessings, either in your own life or in someone else’s, you protect, encourage, and guide. The act of blessing nourishes your soul, so in blessing another you are also blessing yourself. Blessing someone creates a divine intimacy. It is not a sentiment, nor is it a question. A blessing is an invocation of truth, in which the divine heart passes through the blesser and enters the blessed. A blessing is a gift of healing, transformation, and invitation. Each one of us is capable of blessing one another, and it is my hope that we all rediscover and reawaken this divine ability. Again, I don’t want us to get hung up on the language, whether you call it a blessing, a spell, a wish, or a prayer, and whether you believe the blessing comes from you or through you, whether you think a blessing is more powerful when spoken, written or thought, it is a powerful concept. The act of blessing another contains several irresistible qualities that I’ve already touched on, but I’m going to repeat myself here. Blessings are empowering because they provide us with a constructive way to redirect our thoughts and emotions. The negative or low vibe emotions that might otherwise get channeled into worry, frustration, or self-absorption. When you become preoccupied with your own predicament, expand your thinking and offer a blessing to others who might be involved in similar situations: "May we all find resolution and clarity." These shifts in clarity can help you broaden your pattern of thinking so that you aren’t caught up in a web of repetitive and limiting thoughts and beliefs. Blessings also connect us to our capacity to offer good to the world through simple thoughts and actions. Offering a blessing is useful when you wish to be helpful but there’s nothing you can do. It helps to know that, at the very least, you can offer a wish to the person or situation in need. And, when you find yourself responding to numerous requests for your time and your money, it’s nice to have a way to initiate acts of generosity instead. If you don’t have the time to do “random acts of kindness,” offering a blessing can be an alternative that takes practically no time at all. It’s just a matters of thinking a positive though about someone else. This opportunity to move your attention outside of yourself, even for a moment, can be refreshing. Especially when you feel overwhelmed with your to-do list. I invite you to try offering blessings. I also invite you to recognize the difference between empathy and sympathy when you offer your blessings. Empathy is understanding what others are feeling because you have experienced it yourself or because you can put yourself in their shoes. Empathy requires feeling what the other person is feeling, which can be scary and hard. Sympathy is acknowledging another person's emotional hardships and providing comfort and assurance. Sympathy is like viewing the situation from the outside and sometimes feels belittling to the person on the receiving end. When offering a blessing, it’s important that it isn’t passive. While it can be quick and simple, be sure you put yourself in their shoes and try to get a sense of the situation before offering your words or thoughts. You may already be sending blessings in the form of cards or notes. In our detached, digital age, a handwritten note expressing wishes for speedy recovery, condolences, or just warm greetings is a precious communication. Perhaps thinking of those interactions as blessings will shift in some way how you go about them or simply help you value them all the more. You can also develop a habit of offering blessings to people you pass by or interact with, as a way of regularly turning your thoughts toward compassion. This brings us back around to the idea of the marginal characters in your life. Your wish, on their behalf, can be quite simple: "May you find fulfillment in your work," "May your travels be safe." You can also write out blessings to loved ones just as you might tuck a note inside of our child's lunchbox: "May you find unexpected joy today," "May you always know how much I love you." You could also consider including yourself in your blessings, possibly starting the day with a kind thought: "May I feel peaceful and happy today." You can offer blessings in person in the context of conversations with friends, neighbors, or family members. You can bless someone you care about whether they are in distress or overflowing with joy. You can bless as part of saying hello or good-bye. May the Universe bless you with . . .
Be creative; don't worry about the words you use, but focus on your hopes for the person you are blessing or on their hopes for themself. It's also fun to enhance your blessings by finding small objects—maybe a heart or a fallen leaf—that symbolize your wish, or writing your words on something interesting, like a stone. You may feel shy at first about giving blessings. It's always fine to ask permission. It's also great to start with someone you feel very comfortable with. A blessing habit is a beautiful thing. When you offer blessings, you become a conduit for connection—to your own hopes and dreams, to the universe that will act/respond on behalf of the other, to love and light, and to the heart of the other person. The more you offer blessings to yourself and to others, the more contagious it becomes to water these seeds of kindness and generosity in your own mind and heart, and in the world around you. Tell me in the comments below: How would you describe a blessing in your own words? What are three things you are “blessed with” in your life?